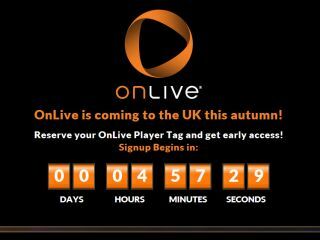 OnLive is on its way to the UK this autumn, but the streaming gaming service isn't wasting any time in getting started, with users able to reserve their player tag from this evening. The UK site, onlive.co.uk, is currently showing a countdown to the sign up, which is set to kick off at 8pm this evening (7 June). OnLive is a cloud-based gaming experience, with games and hardware all held online rather than in your living room. An announcement that it will be running on Intel-based consumer TVs, Blu-ray players and set-top boxes is expected over at E3 2011 this week. The company also struck a deal with HTC earlier this year which saw the Taiwanese company investing around £25 million in the platform. So far we've seen the OnLive hit the HTC Flyer, but nothing in the smartphone arena just yet.